The sound of lawn mowers has been replaced with crunchy leaves and the buzz of leaf blowers. Outdoor pools have been closed and covered, cottages are being closed for the long winter season, and summer toys that once littered the backyard, have been piled into the garage or basement. It’s true that we wish the warm and sunny weather would like a tad bit longer here in Southern Ontario. But, we know it had to come to an end sooner or later and we’d be experiencing the vibrant colours and crisp weather of fall. With Halloween now in the past, stores are now bursting with Christmas decorations and displays. The fact that winter is coming is all too real. Fingers crossed it passes quickly, so that we can welcome spring and summer back! Even if you have room to store these items at your home (commonly your garage), we find that people often have to choose between using their garage to store their summer stuff or for parking their vehicle. By renting a self-storage unit for your summer belongings, you can make room for your car and truck, which means not having to wake up extra early on those cold winter mornings to scrape the ice off your car, which now sits frozen in your driveway. Speaking of cars, fall is also when we experience a lot of vehicle storage and motorcycle storage rentals. Motorcycles, sports cars and classic cars do not fare well in the winter months if stored outside in the harsh elements. Often there is not enough room in the garage for an extra vehicle (let alone a single vehicle or a spare set of tires). A self-storage unit, like our 8’x20’ storage container, is the perfect solution for secure car storage or motorcycle storage until spring and summer return. The Ultimate Gift Hideaway: In an effort to preserve the joy of the Christmas surprise, and avoid having your super sharp kids find out your hiding spot for gifts, store your Christmas gifts in one of our smaller storage units, like an 8x8. This provides the space of a walk-in closet, but also keeps gifts out of reach! Making Room for Guests: The holiday season usually comes with family gatherings, which means you may play hosts to friends and family. These gatherings can be a lot of fun, but they come with a lot of additional stress, extra work and need for space. The solution? Make room for your guests with one of our storage units! Empty out that guest bedroom or get rid of the extra “stuff” in your house that is just taking up space, and temporarily store it all with us. 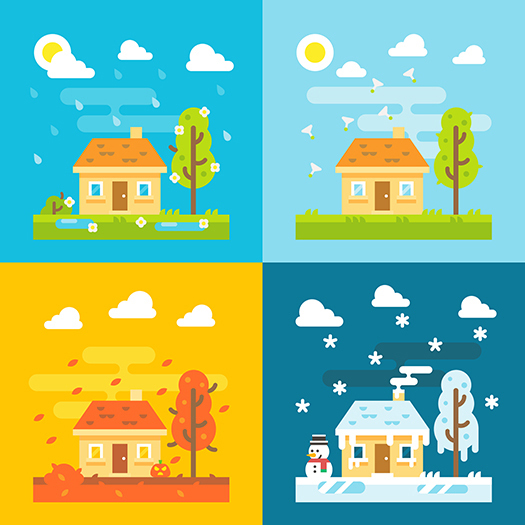 It really is amazing how self-storage can help you prepare for all the changing seasons plus give you the extra space you need throughout the year to help keep you organized and less stressed.